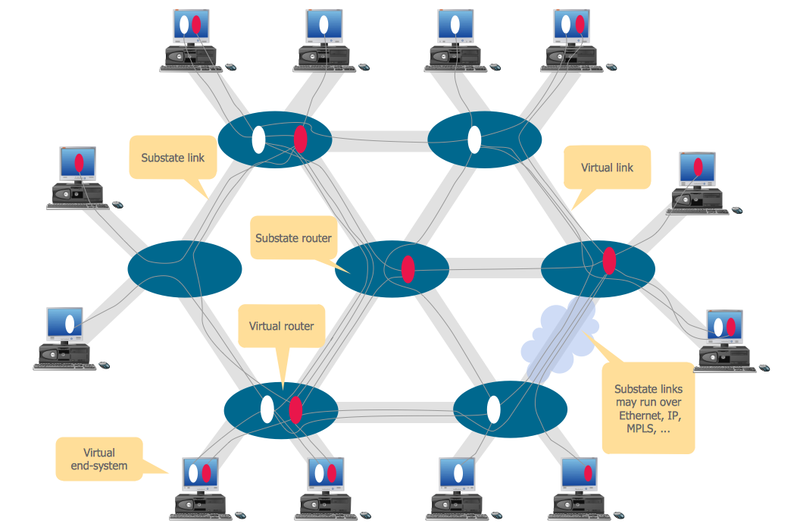 A Virtual network is a computer network that consists of virtual network links, i.e. between the computing devices there isn't a physical connection. Well known forms of network virtualization are virtual networks based on the virtual devices (for example the network based on the virtual devices inside a hypervisor), protocol-based virtual networks (VLAN, VPN, VPLS, Virtual Wireless network, etc.) and their combinations. VLAN (Virtual LAN) is a logical LAN (local area network) based on the physical LAN that is divided on a multiple logical LANs using a VLAN ID. VLAN can be on a VPN (virtual private network). VPN consists of several remote end-points (such as routers, VPN gateways of software clients) that are connected by the tunnel over another network. Two connected end points form the PTP VPN (Point to Point Virtual Private Network), more than two end points form a Multipoint VPN. VPLS (Virtual Private LAN Service) is a specific type of Multipoint VPN. They can be Transparent LAN Services (TLS) that provides geographic separation and Ethernet Virtual Connection Services (EVCS) that provides geographic separation and VLAN subnetting. Virtual Wireless network is a set of Wireless Access Points that behaves as one. Computer and Networks Area for ConceptDraw DIAGRAM provides professional looking examples, the libraries with ready-to-use predesigned vector stencils to help you create the Virtual Networks quick, easy and effective. This example was created in ConceptDraw DIAGRAM using the Computer and Networks Area of ConceptDraw Solution Park and shows the Virtual network. The Internet Connectivity of the computers, mobile devices, computer networks to the Internet enables the users to access the various Internet services. There are many ways and technologies of the connection to the Internet with different data signaling rates: Wireless, Ethernet cable, Optical fiber, Dial-up, DSL, broadband Internet access, etc. This example was created in ConceptDraw DIAGRAM v12 using the Computer and Networks solution from the Computer and Networks area of ConceptDraw Solution Park and shows how the customers connect to ISPs and ISPs connect between the tiers (peering and transit). Intelligent Services Gateway (ISG) is a feature set that is available on the Cisco Routers. ISG provides the session management, the structured framework, the policies for management the various access networks, provides the information about the session bandwidth and network accessibility. This example was created in ConceptDraw DIAGRAM v12 using the Computer and Networks solution from the Computer and Networks area of ConceptDraw Solution Park and shows the Intelligent Services Gateway (ISG) network. Intelligent Services Gateway (ISG) network.